The Market Report: Welcome Back Pathmark! This Allegiance ad was posted on the Pathmark Alumni Facebook group. So get ready to start seeing Pathmark stores again! Interesting that they waited for a while rather than immediately starting calling stores Pathmark, as Key Food did with Superfresh and Food Emporium. 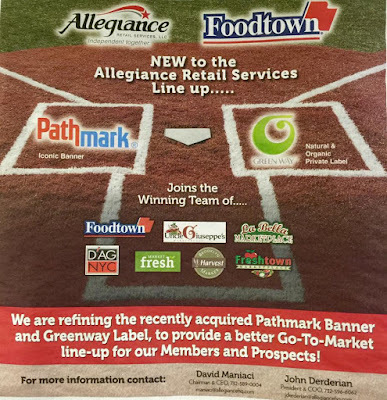 I'm glad it was Allegiance that acquired the PathMark name and not some other chain because Allegiance thinks things out and does everything well. And in the end, no one can do PathMark as bad as A&P did! I agree entirely! I think that's part of Key Food's problem with Superfresh and The Food Emporium, they didn't think it out at all. I'm excited that we'll soon be seeing Pathmark stores again! One thing I'll miss is the consistency we got when it was all corporate run, but hey, uniqueness is cool too, when its done right. Do you think they'll bring back pathmark branded products? It would make sense for them to just continue using Foodtown brand, right? None of the other Allegiance banners have their own brands, unless you count the Ferreira Foods brands: http://ferreirafoodtown.com/ferreira-foodtown-brands/, but those aren't done by Allegiance. That's true, but I feel like the Pathmark name is so iconic, and if it ever reaches the size it used to be, it wouldn't make sense for them to be using a different brand name. A&P did a few companies bad... Food Emporium. Shopwell, Waldbaums, Pathmark, and I am sure there are a few others. Is it really coming back? Or did they buy the name just to keep it away for good? I have heard nothing on any stores opening with the pathmark name. They bought the rights in February of 2016. Here we are February of 2018. I agree thinking things out is smart. This is just too long. My personal opinion is it will not be back. Maybe I'll be wrong. But it will not be the same. Especially with Foodtown brand in a Pathmark. Always remember folks. No other store had the Private label market penetration like Pathmark did. That brand wasn't just iconic. It was strong and good! At times it was 21-26 % penetration. That's just unheard of! !